I hope you find these FAQ’s Helpful on Lake Michigan Charter Fishing out of Northpoint Marina – Winthrop Harbor, IL. Or out of Montrose Harbor – Chicago, Il. Please call me if there are any other questions I can discuss with you. How many persons may I bring along? As of 2012 The NEW MASSIVE CONFUSION made its debut. This vessel is Coast Guard inspected for up to 14 passengers. This is a big step for the Confusion Fleet and is available out of Montrose Harbor. is in compliance with the Coast Guard Regulations and is a great way to accommodate larger groups that wish to be on the same boat together. 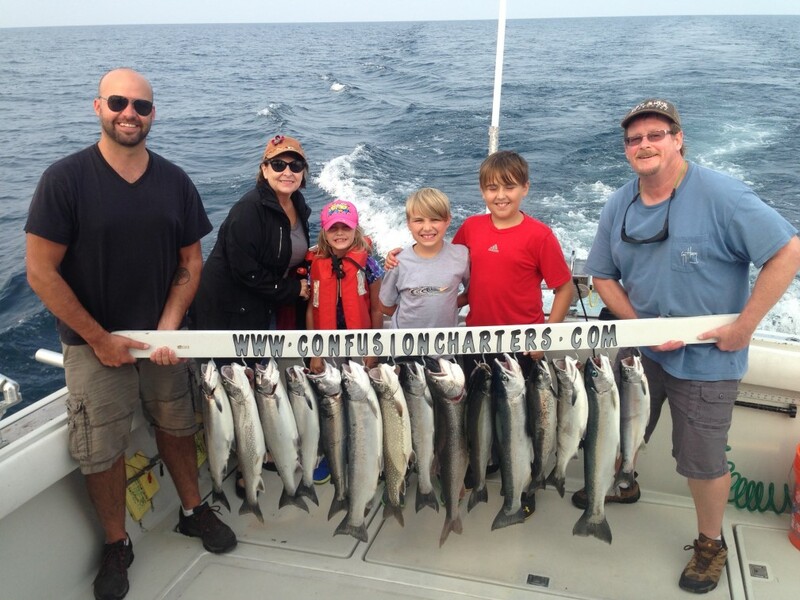 Most Lake Michigan Charter Boats may carry a MAXIMUM of six (6) passengers. For larger groups we have other boats that work with us and we can provide for any sized group/event. Yes a current fishing license with an affixed Lake Michigan Salmon stamp is required in the correct state we are fishing. The Confusion boats fish Indiana, Illinois & Wisconsin waters to get the best catch possible at the correct time of the year. All of our captains are licensed in all of the states near the harbors they fish to give you the fisherman the best odds possible to catch the most fish! Northpoint Marina fishing mostly requires an Illinois License/lake Michigan Salmon Stamp however there are times when the fishing is much better across the border in Wisconsin (Mainly July & August) (To be determined at the day of fishing!) . Montrose Harbor will always require an Illinois License/Salmon Stamp. Licenses are available ONLINE and as a convenience we provide DAILY licenses on the boat to make things easy for you. They are at an additional cost (Illinois 24 Hour License/Includes Stamp-$12 Residents / $17 Non residents) (Wisconsin 2 Day License/includes Stamp $14-Resident or Non Resident the same). Everyone aboard is required to have a license from age 16 and older. May I bring Beer on the boat? Yes Beer & Wine etc. is allowed however ONLY NON-BREAKABLE containers(No Bottles) because of the possibility of breakage on the boat. This is provided you are old enough to bring them along. Absolutely no illegal substances of any kind are allowed on the boat. How long a drive is it to the Marina? Northpoint Marina is located in Winthrop Harbor, Illinois on Lake Michigan, 1/3 of a mile south of the Illinois-Wisconsin border. It is approximately 1-Hour North of Chicago. Parking is free and very convenient. Montrose Harbor is located just North of Downtown Chicago on Lake Shore Drive. The ride is approx. 10 minutes from downtown Chicago hotels by Taxi. Parking is free and very convenient. Do I need to bring my fishing equipment along? No, all fishing equipment including Rods, Reels & Terminal Tackle are provided at no extra cost on board the boat. We carry only the finest equipment available & are well stocked. Is there an age limit allowed on the boat? My best advice is that children under 5 years old may not enjoy the trip & might make it difficult for others also. Children under 10yrs should be accompanied by an adult one on one to get the most out of the trip. Life jackets are on board for adults & children. Is food & drink provided? No, you must bring your own. I suggest a big cooler with cans of beverages & food that is already prepared such as finger foods or sandwiches & snacks. Fish cleaning is available on the boat. How far do we go offshore? The reason for my choices in Marinas is the close proximity to the fishing. Whether it’s early Spring or late Summer in Northpoint Marina we generally fish within 2-4 miles off shore. The result to you is more fishing time. The Chicago boat generally has to venture further offshore to find the best fishing spots.